When it comes to quality workwear, you want more, and when you add these Wrangler Workwear Men's Charcoal Grey WP80 CH Canvas Cargo Work Pants to your workwear wardrobe you get just that -- more durability, style, and comfort. Designed tough canvas weave in a 7 ... (see full details) (see specifications) #WRGWP80CH. When it comes to quality workwear, you want more, and when you add these Wrangler Workwear Men's Charcoal Grey WP80 CH Canvas Cargo Work Pants to your workwear wardrobe you get just that -- more durability, style, and comfort. Designed tough canvas weave in a 7.5-ounce blend of 60% cotton and 40% polyester, these men's utility pants are built to deliver more durability and comfort. Cotton is natures feel-good fabric, and polyester adds lasting durability. 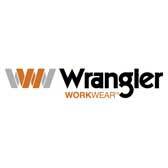 Wrangler ups the wearability with a finish that retains color, releases soil, and resists wrinkles. They're easy to care for, too, machine washable at home or in an industrial wash, light soil. Double-needle stitching and reinforced front pockets add durability. You'll love fit, which features a slightly lower rise than traditional work trousers plus an inseam gusset that puts extra fabric where you need it to allow more freedom of movement for bending, stretching, and stooping. Rear darts improve the fit, too. Longer and wider belt loops accommodate work belts. Plenty of pockets make these durable bottoms functional for workday wear. The two slacks-style reinforced front pockets are a generous 13 inches deep. Set-in hip pockets add more storage, and the left closes with a button. Roomy side cargo pockets feature bellows styling, and each features an exterior utility pocket that closes with a snap. These charcoal-grey trousers go with just about any color top you want to pair them with, making them an excellent choice for uniform wear at work. When you want an alternative to jeans and want comfortable, durable pants that resist wrinkles and release soil, these Wrangler Workwear Men's Charcoal Grey WP80 CH Canvas Cargo Work Pants are an excellent choice. Your workwear specialists here at Working Person's Store are eager to help speed them your way. Order today! These pants are comfortable, fit great and very durable. I bought a pair of these for work and they have made it through the ringer. I am pretty tuff on my work pants so I was surprised to see that I haven't ripped them or destroyed them in two years. I like these pants so much that when it came time to order new work pants I purchased 5 more pairs! I drive a truck for a living and bought these pants to work in. They are great! I have room to move and they look great even after a 12 hour day. They look so nice I am going to buy some for casual wear. Wrangler Workwear Pants: Men's Charcoal Grey WP80 CH Canvas Cargo Work Pants is being added to your cart.